Eight young people gained new skills and experience that will help them with their next steps in life, whether this is finding a job, a place on a training course, or coping with life in general. 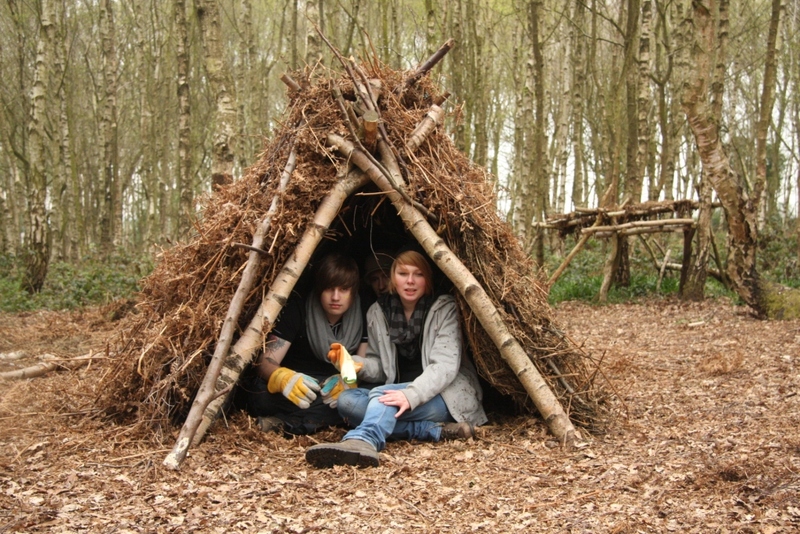 The Bushcraft and Personal Development Workshop took place over a nine week period, with the young people spending one day a week in the forest, leading to an overnight stay in natural shelters they had built. This was followed by time in a recording studio mixing and editing their found sounds into music tracks, and editing film footage. Click here for the press release distributed about this programme. Education 4 Conservation in partnership with Wild Earth, has just successfully completed the first of three Bushcraft and Personal Development workshops, with funding received from CSWP (Coventry, Solihull, and Warwickshire Partnership), and the Warwickshire Youth Opportunity Fund. 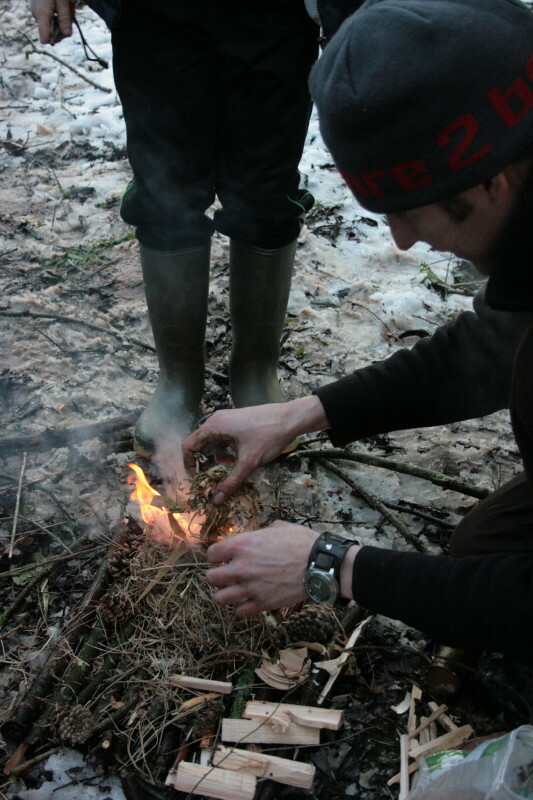 Working with a group of young people aged 16 to 19, the six week programme has included learning bushcraft and forest skills which are a great way of connecting with youngsters, personal development, and CV writing and job search skills. Setting up a camp is an integral part of the course, and involved making fires, shelter-building, collecting water and gathering wild foods. Everything is back to basics. Fire is created by friction, so involved a bit of hard work and knowing the right techniques. Shelters have to be weather-proof (and in snowy and wet conditions this in itself is a challenge), and food and water have to be safe to eat and drink. As well the camp basics, the young people also learn about nature, but more importantly, they learn a lot about themselves. Many courses use the hackneyed phrase “confidence building”, but in this case it is great to see young people’s confidence in their abilities really develop. The group has to work as a team in order to get everything done. If a fire is not built, there is no heat to keep warm and to cook food and heat water. Everyone has to pull their weight to collect wood and kindling, and keep the fire tended. The shelter keeps everyone dry, especially in wet and cold conditions, and is an essential part of the camp. Collecting and purifying water is another important task. In this country, we are never very far from civilisation, but some basic orienteering skills are essential as it is still possible to become lost when you’re in a forest or woodland. Map reading and orienteering skills are also valuable skills to learn. Although it is hard work, and for many young people bushcraft is something completely new and unusual for them, everyone has fun and really enjoys this part of the programme. The other essential part of this course for this age group was to learn CV writing and interview skills. The woodland experiences were used to focus on key transferable skills that are necessary in finding a job and adapting to a workplace or education setting. Communication, teamwork, perseverance, project management, using initiative, are all skills that employers like to see. Some fun indoor activities using visualisation techniques and role play highlighted the connection between the lessons learning in the camp and woodland, and how these could be used to make a CV more interesting, and also give the young people good experiences to talk about at interview stage. The group spent time developing their personal profiles for their CV, and practising interview techniques in a simulated job interview setting. The next six week programme is due to start in March 2010, followed by work on the larger Nocturne acoustic ecology programme. If you would like further information about our courses and workshops, please contact us.